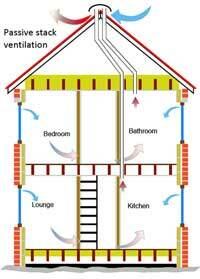 One option to provide domestic ventilation is the use of a passive stack ventilation (PSV) system. This uses a combination of the air flowing over the roof and the natural buoyancy of warm moist air to lift the moist, stale air from the kitchen bathroom, cloakroom etc up ducting to the roof ridge level where it escapes into the atmosphere. Fresh air is drawn into the building through the trickle vents in the windows and doors etc. Without the need for any electric fans or control, PSV systems are energy efficient. The amount of ventilation achieved depends largely on the amount of movement of the external air and the external air temperature. Very little control is available with PSV systems although humidity controlled dampers (which need no electrical power) can be fitted in the ducting to prevent over ventilation. A Passive Stack Ventilation system does need careful design and installation as the air movement along the ducting is achieved just by the temperature/moisture in the air. The ducting needs to relatively large (compared with systems using fans to move the air) and as near vertical as possible without sharp bends. 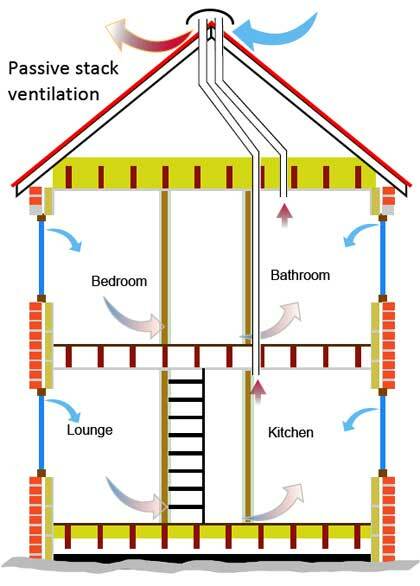 It is really only practical to install Passive Stack Ventilation in a new build or during a major refurbishment. Apart from the ducting, the system includes a roof ridge level vent for external air movements to help extract the stale air. Trickle vents are required in double glazed units to allow fresh air to enter the building to replace the stale air removed by the stack.